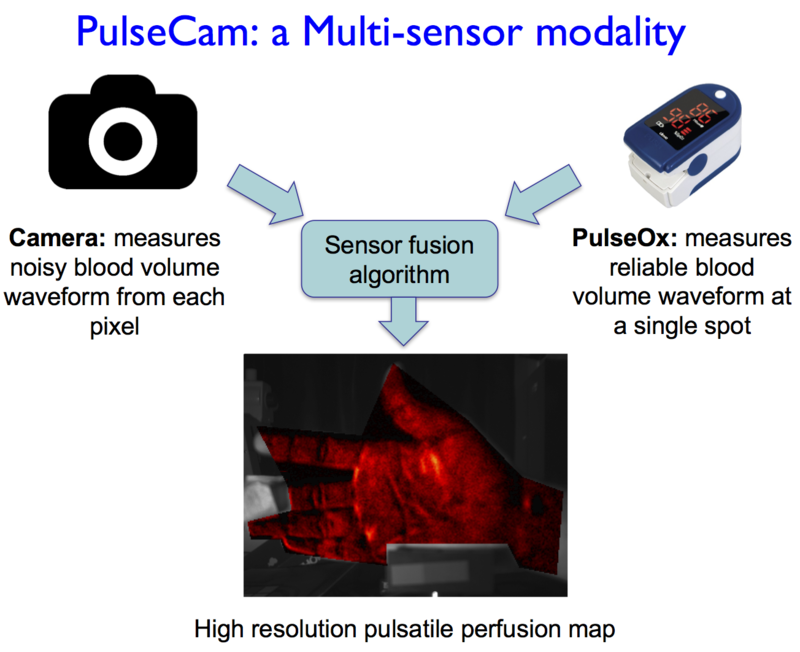 Mayank Kumar, James Suliburk, Ashok Veeraraghavan and Ashutosh Sabharwal, “PulseCam: High-resolution blood perfusion imaging using a camera and a pulse oximeter,” EMBC, 2016. Presentation with a video demonstration. PROBLEM: Adequate blood perfusion is essential for oxygen delivery to cells, and to maintain metabolic homeostasis. Dynamic changes in local perfusion happen due to the changes in body’s physiology during tissue repair, circulatory shock, and wound healing. Therefore, measurement of perfusion is important in both medical and surgical care. However, currently available devices for measuring blood perfusion through surface assessment such as laser Doppler imaging are bulky, ex- pensive, and cumbersome to use. An alternative low-cost and portable camera-based blood perfusion monitoring system has recently been proposed, but these camera-only methods produce noisy low-resolution blood perfusion maps. OUR SOLUTION: We propose a new multi-sensor modality, named PulseCam, for measuring blood perfusion by combining a traditional pulse oximeter with a video camera in a unique way to provide low noise and high-resolution blood perfusion maps. Our proposed multi-sensor modality improves per pixel signal to noise ratio of the perfusion map by up to 3 dB and produces perfusion maps with 2 − 3 times better spatial resolution compared to best known camera-only methods. Blood perfusion measured in the palm using PulseCam during a post-occlusive reactive hyperemia (POHR) test replicates data using existing laser Doppler perfusion monitor but with much lower cost and a portable setup making it suitable for further development as a clinical device.